We did a terrible job staying under budget this month – check the bottom to see if it was a pass or fail (it was close!). Our lack of control in the grocery store was to blame again. Our targeted savings accounts saved our behinds, too, as our car failed its yearly safety inspection and we had to make some unexpected repairs, but our Cars account was up to the task. Kyle is, I swear, incredibly close to buying a smartphone but it hasn’t happened yet, but he hasn’t yet pulled the trigger. INCOME: Two paychecks as usual plus Kyle’s additional income from October, which I’m not going to slice up until December. Rent: Rent is still $895; this was the last month that we saved our rent savings to repay ourselves for our move. Cell Phones: We paid my usual rate of $35 for my dumbphone. We also paid for my new smartphone to reserve it ($277.78), so I’ll start paying the $19/month rate as soon as it arrives. Kyle found an old dumphone and SIM card in our house somewhere and started using that on a prepaid basis until he decides which smartphone to buy. (Can you believe it’s been nearly four months since I washed his phone?! How does he survive?) This month he spent $10.71 on that phone. Internet: Our new rate for internet is now just below $40/month because our cable company upped the modem rental price. Groceries: Another month of being way over budget for our groceries! I wrote last Friday about the strategies we’re committing to for this month and next to get this spending under control. Gas: At least we had a normal month for gas, plus we’re going into December with a full tank! I reimbursed our gas from our Thanksgiving trip. Restaurants: We only ate out twice this month for real but it was fairly expensive. One meal out was over $50, which we’re still perplexed about as we didn’t order expensive dishes! Our second meal was just a casual lunch and the third one was a $5 donation for a fellowship dinner. 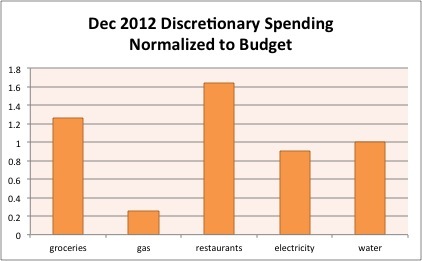 Electricity and Gas: Under budget, here! Next month is the start of the real test as we are now running the heater basically every day. Water: This month we paid our initiation fee, deposit, and two months of water bills. The actual bill part summed to less than what we budgeted so that is what is reflected in the graph, and the other money was reimbursed from savings. Library late fee of $6. Oops! I have many excuses, but it boils down to me not being on top of things. Kyle went to Home Depot for a couple small items this month and spent $16.01. Woah! This month we spent $2,201.05 out of our targeted savings accounts – that’s half our gross income for the month!! The major expense in this category this month was our flights to CA for Christmas ($625.20). We also reimbursed ourselves $60 for the gas for our Thanksgiving trip. We had so many expenses for our car this month! We paid six months of car insurance for $405.47. We spent $30 on our yearly registration and $29.75 to get our car inspected – it failed, so we paid $523.00 for new tires and an alignment. We bought two tickets this month – $24 to see my friend’s handbells group perform a Christmas concert and $10 for a ticket to a basketball game at our university. I ordered my smartphone this month for $277.78. We didn’t have enough in this account to cover the full amount, so we used $120 from here and the rest from our Nest Egg. We donated 10 Thanksgiving meals to one of our local homeless shelters. We had the remainder of our moving expenses come out of this account this month – the refund we got from our cable company, the installation and initiation fees for our water, and our driver license address change fees. We added our final month of rent savings to this account. We took $157.78 from this account to pay for my new smartphone. Finally, we decided to open a new savings account to sequester some money that we will need to pay in taxes but that wasn’t withheld from our paychecks, so I moved $13.61 that had been in this account to that new one. Funded this account with the $13.61 transferred from our nest egg. Finally, finally, Kyle and I sat down to overhaul our budget. Well, I had hoped it would be an overhaul, but things stayed mostly the same. Our rent came down, of course, and we increased our savings to our Cars account, and we just made a few other tiny tweaks. I’ll post the new budget this week. We squeaked through in the black again this month with $6.64 in surplus, which is going into our Travel and Personal Gifts savings account (probably to pay for Christmas). For those of you who zero out, what was your closest month (either way)? What area of your budget are you struggling most with? What was your worst month in terms of being hit with large irregular expenses? 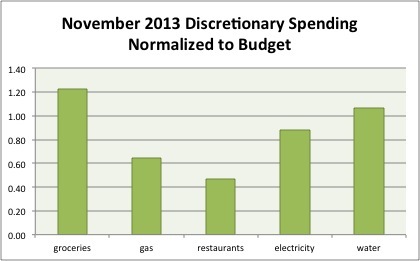 15 Responses to "November 2012 Month in Review: Money"
You had quite a few expenses this month that are not “normal”. (New phone, new tires, prepaid insurance; but you still stayed in the black which is great!!! Thanks to our targeted savings we didn’t have to cover any of those from our general budget! We have all had months like this where lots of abnormals come up. Don’t beat yourself up too much. Just make sure to stay within budget next month and you will be fine. Miss T @ Prairie Eco-Thrifter recently posted..What Would You Do If A Bill Collector Did This to You? Oh, I’m not beating myself up at all – our targeted savings accounts worked exactly as they should so I am proud of our system! Don’t you just hate buying tires? That’s the least fun expense of my year! Wow, it sounds like a crazy month. Coming out of a month like that “in the black” is a happy ending to some pretty overwhelming circumstances, I’d think. Thankfully the savings accounts kept it from being overwhelming. It actually has reinforced for me the benefit of having many small accounts over one large account – since the hits were spread out they were psychologically less impactful. It’s fantastic that you had those accounts funded and were able to get through the month unscathed–great work!! The Electronics account should have had more in it, but we’ve increased our savings rate there so we’ve corrected it, I hope. Welcome back BTW! I’d say this past month was the worst month we’ve ever had in terms of irregular expenses (I’m blogging about it tomorrow). We had to buy a car and bought a new washer/dryer. Jason @ WSL recently posted..Opt-In (again) to my Newsletter! Wow, those are major expenses! I look forward to reading your post. My food spending has gotten out of whack lately. Budgeting while in a couple is far harder than budgeting while single since my boyfriend pays for stuff and I pay for stuff and who pays for what can be a bit inconsistent. So, my grocery spending has been going up and my eating out spending has gone down significantly. I think that my influence has reduced his eating out somewhat because he doesn’t keep any food at his place and we always cook if we’re hanging out at my place. I’m going to re-evaluate my food budgets after a few more months of this and see what the new normal is. 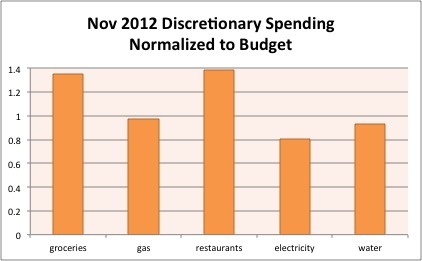 I’m not concerned for now since the overall food budget is less than the actual spending, even if the spending is different around those categories. I can’t wait to hear more about your Republic wireless phone!! Have you considered buying a cable modem? I did that earlier this year and it quickly paid off. I’m curious to see what happens to my electricity costs in the winter considering that my bimonthly bill went from $30 to $60 without the heater turned on. I have a feeling it could go up to $120 for two months through the winter. If eating in is up and eating out is down you’re probably net down still, right? When we were dating Kyle only had, like, macaroni and cheese and chili ingredients at his apartment but his place was bigger than mine (and had a TV) so we still hung out there most of the time. I can’t wait to GET my Republic Wireless phone! This has been SO LONG coming. I feel like now that I’ve paid for the hardware it should really be on the way, but it isn’t yet as far as I know. Oh, and Kyle bought an iPhone 5 yesterday at long last! We are considering buying a modem, but Kyle researched it and the one that would actually improve service in our area is way more expensive than our savings over the next 2 years. Apparently our downloading speeds are not at all what was advertised. Buying the nice modem is on the table. I think our electricity bills peaked around $130 at our last place. I’m hoping we won’t have such high spikes now that we’re on electricity and gas.